Gastric cancer is one of the most prevalent malignancy worldwide. Gastric adenocarcinomas are typically associated with high mortality and limited treatment options. Subcutaneous implantation of the NCI-N87 human gastric tumor cells into immunocompromised mice can be utilized as a platform to test new drug candidates as well as predict in vivo drug responses in humans. Xenograft murine models aid in the investigation of targeted agents aiming to improve the clinical outcome of gastric cancer patients. The NCI-N87 tumorigenic epithelial cell line was derived from a metastatic site in the liver of a male patient with gastric carcinoma. NCI-N87 has been positively tested for myc and erb B2 oncogenes. Furthermore, it expresses carcinoembryonic antigen as well as TAG 72 surface glycoproteins. The NCI-N87 cell line is EGFR-positive, human epidermal growth factor receptor 2 (HER2) positive and responds to cetuximab as well as carboplatin both in vitro and in vivo, as per a 2012 study in Gastric Research. The 2015 Molecular Clinical Oncology study (Harada et al.) also used the NCI-N87 model to test combination therapy in HER2+ human gastrinoma. A common combination chemotherapy regiman include capecitabine/oxaliplatin (XELOX), 5-fluorouracin (5-FU)/cisplatin, or trastuzumab/capecitabine/cisplatin and this study identified that trastuzumab with XELOX resulted in upregulation of thymidine phosphorylase (TP) and may mediate interactions between NK and NCI-N87 cells; this has potential for clinical translation. Xhang et al. (2013) also used the NCI-N87 cell line to successfully establish a peritoneal gastric carcinoma xenograft model to support survival outcome analysis. The last example study is the Clinical Cancer Research article by Yamashita-Kashima et al. (2011) which used the NCI-N87 model to demonstrate the significant efficacy enhancement of combination therapy with pertuzumab and trastuzumab against HER2+ gastric carcinoma; the mechanism of action was shown to inhibit cell growth, increase apoptosis and ADCC-mediated cell killing as well as have antiangiogenic activity. The NCI-N87 cell line is used to create the CDX (Cell Line Derived Xenograft) NCI-N87 xenograft mouse model. 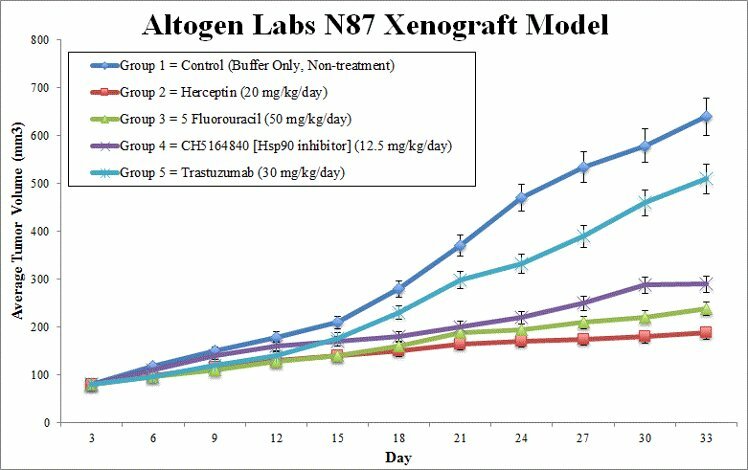 NCI-N87 is a HER2-positive gastric cancer xenograft model utilized in studying pre-clinical monotherapies and combination therapies (e.g. pertuzumab, trastuzumab, 5-FU). After continuous cell growth at exponential phase, NCI-N87 cells are trypsinized, viability and cell count determined and suspension concentration adjusted prior to injection. 1 x 106 cells (vol = 100 µL) of a Matrigel + NCI-N87 suspension are injected in 12 week old athymic BALB/C (nu/nu) mice. Cells are subcutaneously injected to the rear hind leg (flank). Injection sites are inspected and palpated until tumors are established. Calipering of tumors allows the in-life portion of the study to begin when an average size of 50-150 mm3is reached. Randomization, based on tumor measurements, into client determined treatment groupings is performed. Injections of the client supplied test material follows the treatment schedule. Daily tumor measurements (digital calipers) and mouse whole body weights (3 times weekly) are recorded. Animals are sacrificed and tissues are collected. As instructed by client, tissues can be frozen (LN2), stabilized (RNAlater) or fixed for histological analysis (10% NBF). Additionally, tumors are weighed and documented (digital imaging).